Rescue workers at a cabin near the peak of Mount Ontake in Japan on Sunday. Thirty-one hikers were found unconscious and apparently dead near the peak of a volcano in central Japan on Sunday, a day after it suddenly erupted, a police spokesman said. The danger of another eruption and of a release of toxic gases made it impossible to bring most of them down and confirm their deaths, he said. The spokesman, Naofumi Miyairi, said that a perfunctory check by rescuers on the mountain indicated that their hearts and lungs appeared to have stopped, making it all but certain that they were dead. 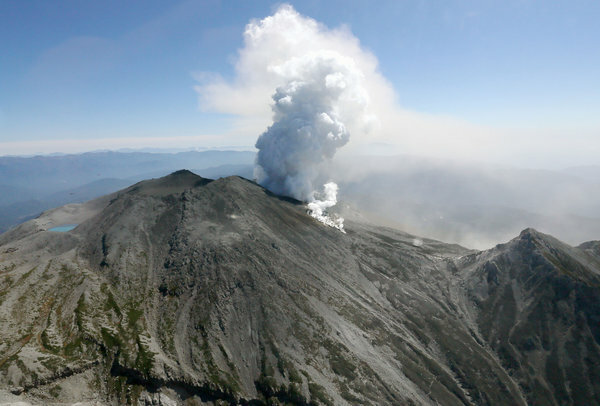 Mr. Miyairi said rescuers had found the fallen hikers near the top of Mount Ontake, a 10,062-foot volcano that erupted in a spectacular geyser of ash on Saturday, when the mountain was busy with climbers who had gone to see the first signs of autumn. Japanese officials are often reluctant to declare people deceased until their death can be confirmed by a doctor. However, four of the hikers were later declared dead by doctors after their bodies were carried down, according to NHK News, Japan’s national broadcaster. Television images showed that ash had blanketed the mountain’s upper slopes, turning them into a gray, lifeless moonscape. Mr. Miyairi said that many of the hikers were also found covered in ash. He said rescuers carried four of the fallen climbers down the mountain, but the rest had to be left behind, as the mountain continued to spew smoke on Sunday. Local news reports said the top of the mountain was wrapped in a pungent odor of sulfur, raising fears of poison gases and new eruptions. The volcano, which straddles the prefectures of Nagano and Gifu, two mountainous regions northwest of Tokyo, has erupted before, most recently in 1991. There had been weeks of minor earthquakes leading up to the larger eruption on Saturday, but nothing that seismologists had interpreted as a warning that a major event was on the way. Mr. Miyairi, who is a spokesman for the Nagano prefectural police, said rescuers might have placed many of the bodies inside huts on the mountainside that had served as shelters for hikers, though he would not have full information until the rescuers returned from the mountain. 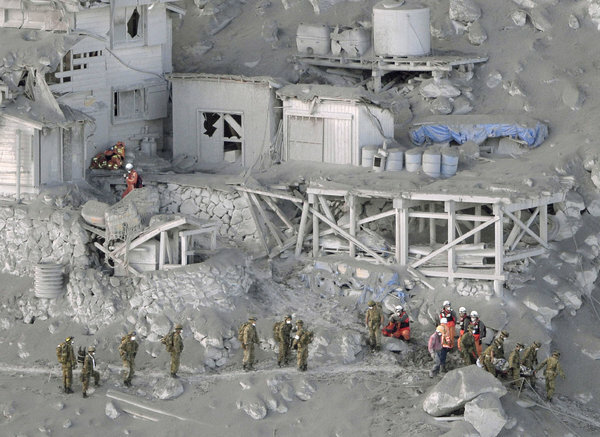 Rescue workers carried a victim from a cabin, left, near the peak of Mount Ontake after the volcanic eruption in Japan. The rescuers included soldiers, police officers and firefighters, local news reports said. Earlier on Sunday, military helicopters were able to reach the volcano for the first time, after being blocked by the thick ash in the air. Television footage showed one helicopter that had rescued three hikers, who appeared to be conscious. The Nagano prefectural government’s emergency response center said that many hikers had descended on their own, though others appeared to be trapped in shelters awaiting rescue. It said 30 of the hikers who had left the mountain were being treated for injuries, some serious. An additional 10 hikers who were injured were being treated in Gifu, according to local news reports. The reports said that at least 250 hikers could have been on the mountain when it erupted. 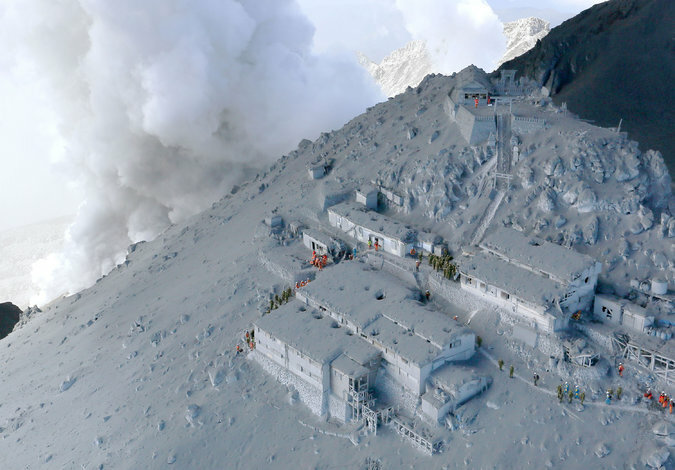 Nagano’s response center could not confirm local news reports that about 45 hikers were still missing on Mount Ontake. Those reports also said a dozen hikers remained stranded in shelters on the volcano’s slopes, trapped by the eruption and possibly injured or unable to breathe properly because of the ash. This entry was posted in Uncategorized and tagged accident, Gifu, hikers, Japan, Japanese, Mount Ontake, Nagano, news, Tokyo, volcano, volcano eruption, world news. Bookmark the permalink.